Grosset & Dunlap, 9780448483610, 144pp. Not only is Hank Zipzer the world's greatest underachiever, he's also a master at making lists. 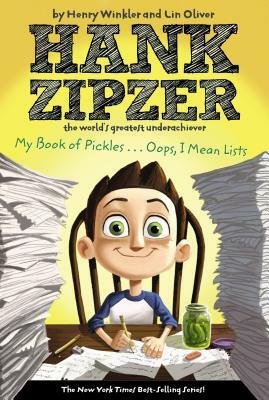 Now readers can revisit their favorites with this hilarious collection, which compiles some of the best lists from the books in the Hank Zipzer series. In one, Hank describes ten reasons why summer school stinks worse than his gym socks. In another, he offers ten creative ways to retrieve the permission slip you left under the Chinese vase at home. This fun collection will also feature an introduction and several brand-new lists from authors Henry Winkler and Lin Oliver. It even includes sixteen blank pages for kids to cut out and create their own book of lists! Lin Oliver is a writer and producer of movies, books, and television series for children and families. She has written over twenty-five novels for children, and one hundred episodes of television. She has produced four movies, many of which are based on children's books. She is cofounder and executive director of the Society of Children's Book Writers and Illustrators, an international organization of twenty thousand authors and illustrators of children's books. She lives in Los Angeles with her husband, Alan. They have three sons named Theo, Ollie, and Cole. She loves tuna melts, curious kids, any sport that involves a racket, and children's book writers everywhere.